Larry Lamme stands outside his Pausch Road home where a camper was blown over by Friday afternoon’s storm. Damage from Friday’s storm is shown along Milner Road. Matthew Reveal said he was sitting in his Pausch Road home late Friday afternoon when it started vibrating. Then he looked outside and through torrential rain saw trees and a swingset down, and a large camper next door blown over close to the back side of a residence. Dave Bushelman, deputy director of the Highland County Emergency Management Agency, said the National Weather Service was planning to meet with him Saturday morning to try to determine what caused the damage in the Pausch and Milner roads area just southeast of Leesburg. Fairfield Road was barricaded due to high water running across it, and scanner reports said a large tree was completely blocking SR 28. Larry Lamme, who lives at 1151 Pausch Road, said he was in his house when he heard something bang and hit a window on the backside of his residence. “It was windy and rainy and it was really blowing,” Lamme said. “You couldn’t really see nothing,” his wife, Donna, added. The storm blew over a large Salem pull-behind camper the Lammes’ son owns. It was parked behind their house and it appeared that the only thing that kept it from hitting the house was maybe a foot or so in distance or a couple tall pine bushes. Larry Lamme said there was also siding damage to one end of his home. 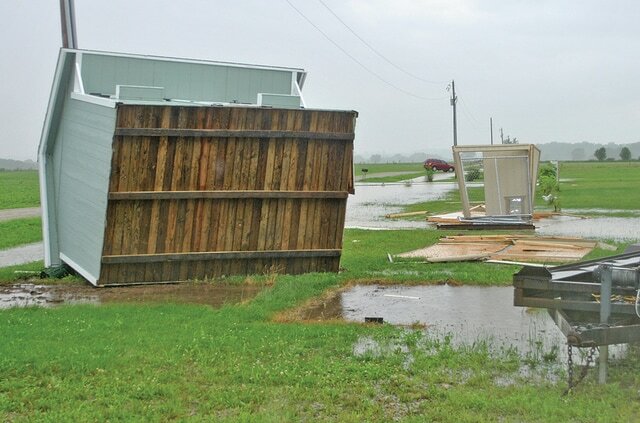 Just a few hundred yards away on Milner Road, the storm destroyed both a large and a small outbuilding, and blew another building over on its side. Bushelman said a couple houses in Samantha were damaged along with a barn on Pausch Road. There were also reports that the old Fairfield Meetinghouse, located at the corner of Fairfield Road and SR 771, lost part of its roof and some of the bricks on one wall. Completed in 1823, it is the oldest existing church building in Highland County. Brenda Page, who lives next-door to the Lammes, said the storm blew water through a window into she and husband Dean’s master bedroom. She said her son, Reveal, told her the storm shook the whole house. “I was scared,” Reveal said.